Refuse derived fuel (RDF) is a broad term that covers a range of fuel types, made from a variety of different types of refuse or solid waste. Commercial, post-industrial and post-consumer waste can all be converted to fuels. These include boiler fuel, pelletized fuel, syngas, cellulosic ethanol, biodiesel, and other second-generation liquid transportation fuels. Vecoplan is experienced with all types of refuse and the various types of fuels they are converted to. Waste-to-Energy systems employ a combination of mechanical, biological or chemical processes to recover the energy stored in waste. Modern waste conversion technologies are increasing the energy recovery rates from waste, reducing emissions, reducing residues, producing fuels that can be stored more easily as well as for longer periods than electricity, and inherently recover recyclables. These technologies include gasification, plasma gasification, plasma arc gasification, torrefaction, pyrolysis, thermal depolymerization, anaerobic digestion, mechanical biological treatment (MBT), and fermentation. Processing and preparing the waste stream prior to its conversion to fuel is an integral part of advanced Waste-to-Energy plants. 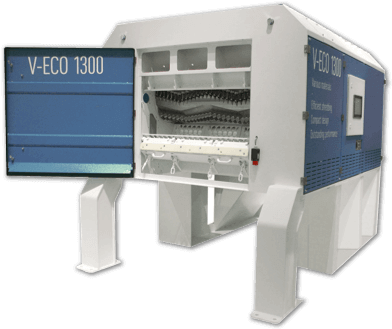 Vecoplan provides these material prep systems. Vecoplan delivers turnkey RDF systems that process waste as a feedstock for the production of alternative fuels and energy. The equipment included in our systems is determined by the composition of the waste feeding into the system and the specifications required on the material that feeds out. Waste recyclig machines and waste recyling technologies available from Vecoplan for waste-to-energy prep systems includes: Receiving stations, Primary size reduction, Screening, Air classification, Metals separation, Optical sorting, Secondary shredding, Storage, Testing, Metered feeding, Conveying between workstations, and Integrated controls for the entire system. Most systems employ some, but not all of these. Knowing which to specify and how to incorporate the best technologies to get the job done is the key to success. Vecoplan has this expertise. Vecoplan has experience in the design, engineering and construction of machinery and systems for commercial, industrial, and municipal RDF plants. Our industrial waste recyycling systems operate in municipal facilities for the production of liquid transportation fuels from MSW (municipal solid waste) residuals. We have inudstrial waste recycling equipment used in factories that process paper and plastics waste to produce alternative fuel pellets. 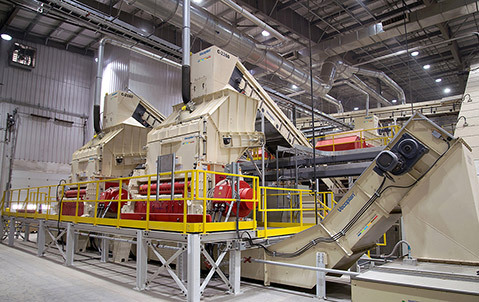 Vecoplan waste recycling machinery is incorporated into plants that convert agricultural refuse, such as corn stover, into cellulosic ethanol. Cement plants use Vecoplan refuse derived fuel systems to produce fuel for their kilns. Some of the worlds largest wood pellet factories have Vecoplan machines, also. From initial consultation, design and engineering, to manufacture, construction and installation, through training, parts and service, Vecoplan delivers technologically advanced systems that turns waste into refuse derived fuel for the production of energy. Bottom line - no matter what type of refuse you’re talking about, what conversion technology you’re employing, or what kind of fuel you’re making, no one can match the experience that you get when you work with Vecoplan.